This week the Annecy International Animation Festival, which every year sees the great and the good of the animation world descend on the eponymous French town. One piece of news to emerge from this year's event is the stepping up of the UK's Animatsu Entertainment on to the global stage. The company set up to license and distribute anime in in the UK and Ireland also announced early on plans to get more directly involved in anime co-production themselves. 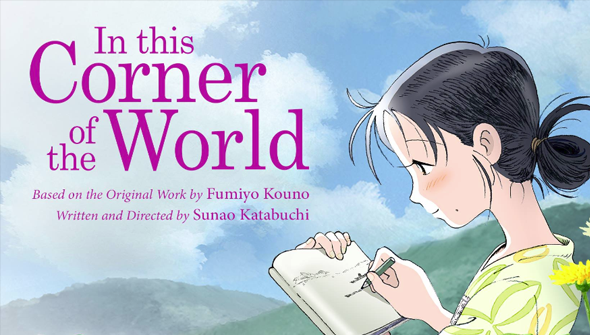 Starting as they mean to go Animatsu have acquired the global rights (outside of Japan) for the in-production feature In This Corner Of The World. Directed by Sunao Katabuchi,- director of Mai Mai Miracle and assistant director of Kiki's Delivery Service- the war-time drama is adapted from a manga by Fumiyo Kouno. The story follows a young girl named Suzu who in 1944 moves to the small town of Kure in Hiroshima to live with the family of her husband. The wartime setting will invite comparisons with Grave Of The Fireflies and Barefoot Gen, but Animatsu's Jerome Mazandarini thinks the film has something unique to offer. "There have been previous anime films set around the devastation in Hiroshima, but none with the ultimately uplifting and positive message of In This Corner of the World, so we can’t wait to bring this beautiful film to Annecy", Mazandarini stated. The film was partially funded by crowdfunding, raising 39 million Yen- about $350,000. Animatsu and producers GENCO presented a work-in-progress at Annecy on Thursday morning. The film will be released in Japan this October.